The word ‘Fresh’ is made out of fake grass stick onto raised wooden letters (we looked into making it out of real grass which has been freeze dried or self irrigated, which is possible but it’s £1000!). Fresh & Fruity. Designed by Good People. We love old fashioned fruit stickers. They look great. Why not take the personality of these and make them work for a shop front? We gave this a different treatment for the roller shutters to make it look like the shop is open with an old bicycle parked outside. To see more ‘What If’s’ click here. To see our ‘What If Ilfracombe’ project click here. To find out what other people think of the what if project click here. 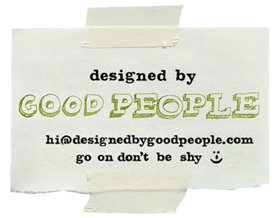 To find out more about Designed by Good People, what we think and what we do click here. Are you just concentrating on the facade or producing concepts for the interior, too? I remember talk about extending back into the office or installing 3-tier shelving (instead of 2 levels at the moment). The old fashioned hand-painted signs on the walls/ceiling are also a lovely feature, it would be great if you could bring those outside, too like the fruit labels idea (2a). At the moment wer’e only looking t the outside, as with all the What If’s. Much as I’d love to makeover the whole shop (or shops) in the High Street, that is a lot more work and more than I’m willing to give for free! Most shops seem to make a complete mess of their shop fronts these days due to poor design from signage companies that really don’t know what they are doing. 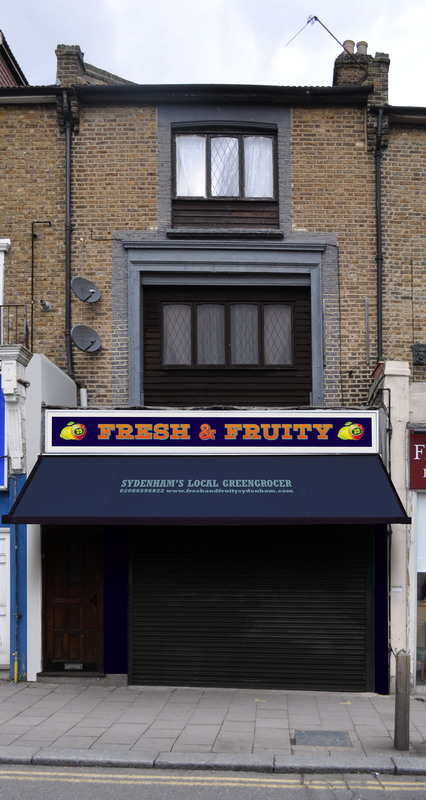 Hopefully this raises the debate further at a time when guidelines are being written by the council specifically about shopfront design for Sydenham to encourage better design. The typeface in option 2 reminds me of a fish and chip shop (not sure why!). I love the imagery printed on the shutters. 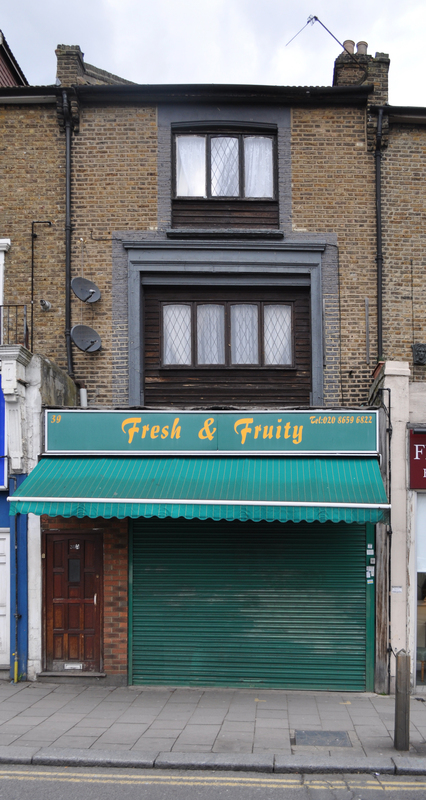 My only concerns are that they would easily be spoilt by graffiti tagging, and are they the ‘right’ type of shutters as per Lewisham’s shop front guidelines, which I think encourage open-grille instead of solid shutters. And well done for including the building number on the shop signs. thanks for your feedback. I think once you see the second sign in context when the shops open and you see the fruit you wont be thinking of a chip shop. 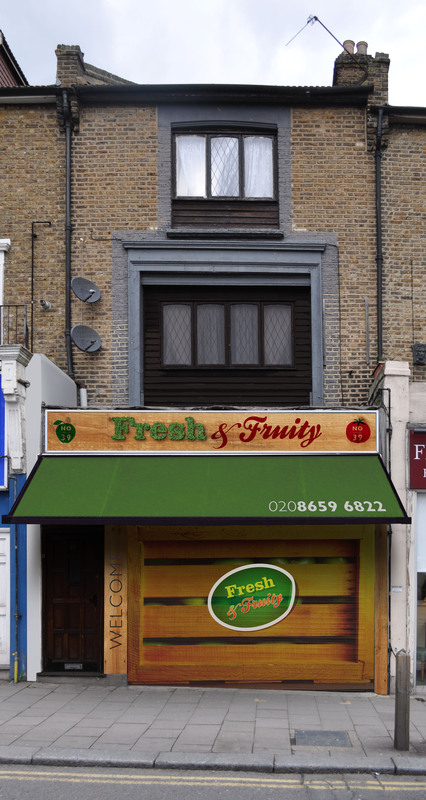 Or perhaps we will use that one for a chip shop in another What If! With the shutters, this is a common comment. Any security shutter will breed graffiti which is why we don’t like them and would persuade any business owner to think again before in stalling them. they are expensive and make no difference to insurance premiums. 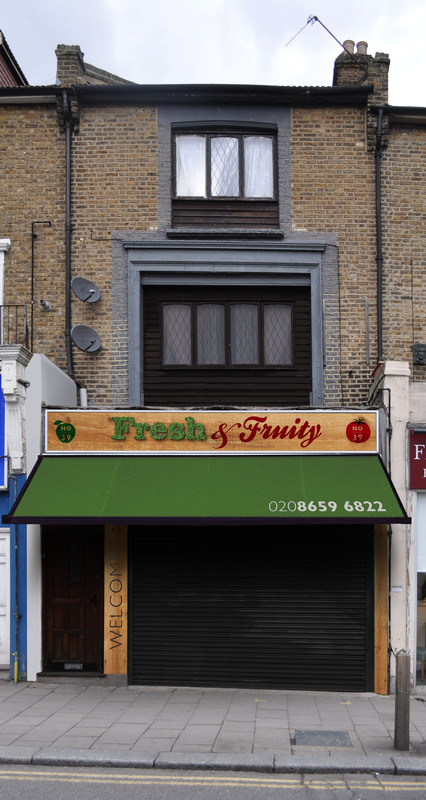 In this case the shop doesn’t have a shop front and the shutters are the existing ones so the shutter has to be there. But you are right, the open type are the only ones allowed by Lewisham planning, however they don’t seem to enforce their guidelines nor publicise them! You will find that the shutters that get the most graffiti are the ones that look tatty and uncared for. There are many cases where roller shutters are decorated in some way and they seem to stay graffiti free. The typeface for the route you prefer will be very legible once on the shop front, I promise!